The Community Development and Knowledge Management for the Satoyama Initiative Programme (COMDEKS) was launched in 2011 to support local community activities that maintain and rebuild target production landscapes and seascapes, and to collect and disseminate knowledge and experiences from successful on-the-ground actions so that, if feasible, they can be adapted by other communities throughout the world to their specific conditions. The programme provides small-scale finance to local community organizations in developing countries to support sound biodiversity and ecosystem management as well as to develop or strengthen sustainable livelihood activities planned and executed by community members themselves. The COMDEKS target landscape for activities in Namibia is the Iipumbu-ya-Tshilongo Conservancy, spreading across 154,800 ha and located in the Otamanzi and Uuvudhiya constituencies of the Oshana and Omusati regions of northern Namibia. The COMDEKS target landscape for activities in Namibia is the Iipumbu-ya-Tshilongo Conservancy, spreading across 154,800 ha and located in the Otamanzi and Uuvudhiya constituencies of the Oshana and Omusati regions of northern Namibia. With the Etosha National Park at its southern boundary, the Iipumbu-ya-Tshilongo lies within a transboundary wetland shared almost equally by Angola and Namibia. This wetland is called the Cuvelai-Etosha Basin and consists of hundreds of drainage channels (called iishana, singular oshana) that emerge and diverge hundreds of times. Most iishana in the target area are dry for much of the year, and when water flow does occur, it ranges from tiny trickles to broad fronts of flood waters, inundating most parts of the basin. The basin has no sea outlet, however, when the northern parts of the basin receive a lot of rainfall, water will usually flow into the Etosha Pan via the iishana, thereby creating a spectacular ecosystem that supports a diverse array of bird and other animal wildlife. The rainfall season is generally from November to April and the landscape stretches over two rainfall zones. The northern part of the landscape receives an average of 400-450 mm rainfall per year, while the South receives 350-400 mm. In terms of elevation, the landscape lies between 1,100 and 1,200 meters above the sea level. Moving in the east-west direction, the landscape is extremely flat, with little change in altitude or relief. However, there is a gradual reduction in altitude when moving north to east towards the Etosha Pan. In terms of vegetation and soils, the landscape can be divided into two distinct areas. Vegetation in the southern part of the landscape is predominantly shrublands dominated by the mopane tree. The soil is a mix of alluvial clay and aeolian sandy soils, which are generally salty as a result of high rates of evaporation. The northern part of the landscape is characterized by a combination of deep Kalahari sandy soils on higher ground and water-borne clays in the low-lying channels and plains. The sands and clays are molded and mixed to form fertile soils which can support agriculture. Consequently, the majority of the communities are in this area, and this has led to greater land degradation than in the south. One of Namibia’s most notable characteristics is its extraordinary biodiversity, which consists of a wide range of mammal, bird, amphibian and plant species. Because of the aridity of the country, the distribution of species is often dependent on rainfall patterns. Currently, approximately 50 percent of species in Namibia are of conservation concern, mostly as a result of a history of poaching, or because of habitat loss due to agricultural production. It has been estimated that about ten mammal species have already become locally extinct, and species such as zebras and lions have experienced a 95 percent reduction in number over the past 200 years. Conservation efforts, driven largely by the creation of the system of conservancies, as well as support from governments and NGOs, have helped to restore previously declining populations of lions, cheetahs, black rhinos, and zebras. Currently, in the Iipumbu-ya-Tshilongo Conservancy, there is no structured system for managing wildlife in the conservancy. Animals are able to move fairly freely from the nearby Etosha National park, which can lead to conflict with grazing livestock and farmers. Additionally, increasing freshwater scarcity is a threat to local plants and animals. Land use in Iipumbu-ya-Tshilongo is divided into three distinctive zones: crop farming, livestock farming, and conservation and tourism. Approximately 75 percent of the land is dedicated to crop and livestock farming, with these land uses predominantly found in the northern part of the landscape. Of all the crops, pearl millet (locally known as Mahangu) is by far the most common and widespread. Small areas of sorghum, maize, and vegetables are grown as well, but mahangu is the favored staple cereal. The vast majority of crops are produced on dryland or rainfed fields. Livestock farming is predominantly cattle farming, followed by goat farming. There is seasonal grazing of livestock, where livestock are moved between the residences of their owners in densely populated areas and distant grazing lands, called cattle posts. Most movements are within the areas of jurisdiction of the cattle owners’ traditional authorities. The 2011 census data shows that the population density of cattle was one per square kilometer, and that, on average, each household owns 10-15 cattle, primarily from the local Ngunis (Bos Taurus) breeds. The remainder of the land in the southern part of the conservancy is dedicated to tourism and conservation efforts. The largest challenge facing the target landscape across the three zones is scarcity of water. There is lack of availability of permanent and sufficient sources of non-saline water. The landscape, located in a semi-arid area with relatively poor soil quality, is very susceptible to drought and flooding, and the majority of the population relies on the iishana, which collect water in low areas. However, these are not a reliable source of consistently available, clean water. This scarcity is putting increasing pressure on the ecology of the region, on agricultural production, and on the well-being of local communities in Iipumbu-ya-Tshilongo. The total population of the Iipumbu-ya-Tshilongo Conservancy is estimated to be 13,500, with an average population density of just 10-14 people per square kilometer, and the majority settled in the northern part of the conservancy. Although approximately a quarter of the land is set aside for conservation efforts and tourism, the population is highly dependent on agriculture and livestock farming for survival. Due to the lack of available freshwater, the majority of crops produced are using a “low-input, low-output” system to mitigate the risk of crop loss due to inadequate rainfall or pests. As a result, crops are limited mostly to production of staple foods such as pearl millet, although small areas of sorghum, maize, and vegetables are also grown. Namibian land policy allows communities to proactively address habitat conservation and natural resource protection, resulting in a system of over 70 conservancies. Conservancies are created within existing communal areas, where local community leaders enter into collaborative management agreements with the state. Members of the conservancy are given shared rights to the land, which cannot be entered or occupied without permission from local authorities and the conservancy management. A vast majority of community members live on small farms to which they have customary user rights, which are administered by the Uukwaluudhi Traditional Authority. There are approximately 1,500 of these holdings, most of which cover less than 10 ha. Households in the landscape traditionally depend directly on natural resources for most of their needs. These include grazing of grasslands for livestock, poles from trees for fencing and home construction, wild fruits (e.g., marula fruits) for consumption and production of beverages, grass for thatching and production of baskets, and wood for fuel, fish traps and storage containers and many other uses. Poorer households are more dependent on natural resources compared to wealthier households; hence, poorer households are at a severe disadvantage in areas where community land resources have been diminished. Unsustainable use of natural resources as well as deforestation is evident in the landscape. Reduction in ecosystem services, particularly for livestock farming: In the 1980s, the changing climate, population growth, and unsustainable utilization of natural resources greatly disrupted the landscape’s previously intact ecosystems, resulting in a decrease in carrying capacity of the grazing lands and a shortage of water for farmers and livestock. These impacts led farmers to move further towards Etosha Pan to look for crucial pasture and water sources for their livestock, and better lands for agriculture. Therefore, the trend observed in the area is a decreasing capacity of the landscape’s ecosystems to provide services that support livelihoods. Deforestation: This is primarily driven by tree cutting for fencing, home construction, and household energy requirements. However, community forest initiatives and other efforts, such as encouraging people to switch to bricks for building materials, are gradually yielding results, as is the promotion of alternative energy sources and energy-efficient stoves. The net effect is that woodland areas are slowly increasing in number. Loss of agricultural biodiversity: Local or indigenous mahangu (pearl millet) varieties in the landscape are disappearing, partly due to the fact that very few community members are growing these local varieties. According to community members, this shift in varietal preference is partly driven by government food security projects that have promoted the use of improved millet varieties at the expense of the local varieties. Unfortunately, the new varieties are not well adapted to the local climatic and soil conditions, thus they do not grow as well as local varieties. If nothing is done to address this loss in agricultural biodiversity, indigenous varieties of mahangu may be lost. Negative impacts of climate change: The current climate change projections indicate that the inter-annual climate variability (drought and flooding) will become more frequent and intense. Droughts and floods are not new phenomena in the landscape, but in recent years these two hazards have become more severe, according to community members. Climate variability is also affecting the crop production season, particularly for mahangu. Other negative factors are also affecting household food security, including increasing levels of soil degradation, increasing surface water runoff as a consequence of decreased soil permeability; and increasing evapotranspiration. The result of this combination of factors has been livestock losses, reduced milk production (due to reduced grasslands available for foraging) and lower crop production. Lack of appreciation for ecosystems: Lack of knowledge or awareness of the significance of local ecosystems and their importance to daily life contributes to ecosystem degradation, particularly in the face of pressing survival needs. For instance, household energy and building needs are currently superseding the concern for protecting and preserving the forest. As a result, the landscape exhibits gradual but steadily increasing deforestation. Weak institutions for biodiversity and ecosystem protection: During the consultative process, it was clear that most stakeholders are aware of the national laws that protect ecosystems and biodiversity such as forests. However, enforcement of these laws at the community level is proving to be difficult due to weak institutions for ecosystem protection. This challenge is compounded by the lack of awareness amongst community members on the importance of protecting ecosystems. Limited access to markets for commodities produced in the landscape: Markets are important for agricultural growth and sustainable development. Feedback from stakeholders indicates that there is limited market access for various commodities produced locally, such as livestock, crafts and natural plant products. The market access challenge is compounded by poor infrastructure and connectivity that results in higher production and transaction costs. Outward migration of labor: The reduction in the ability of the landscape to support current livelihoods is partly driving the need to seek alternative livelihood options, which are usually outside the area, thus resulting in migration out of the landscape. Migration rates are usually higher among younger people as compared to older members of the community. This outward migration of labor is negatively affecting household food security. 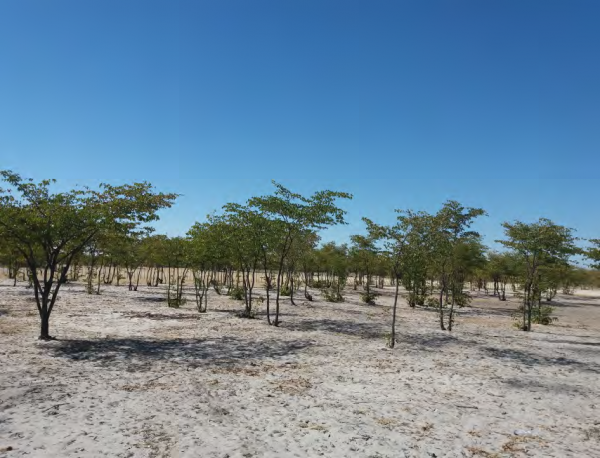 The Iipumbu-ya-Tshilongo Conservancy was selected as a COMDEKS pilot landscape primarily due to its biodiversity, sensitive ecosystem, and tourism potential through its proximity to the Etosha National Park. Another selection factor is that this area ranks amongst the most underdeveloped areas worldwide in terms of its social, economic, agricultural and ecological aspects. In March 2014, a Baseline Assessment was conducted to evaluate the state of the landscape and to identify key issues. Community members were invited to participate in the assessment at a three-day workshop; 38 stakeholders took part, including 15 women and 23 men. The workshop was carried out in English and in Oshiwambo, the local language for most of northern Namibia. 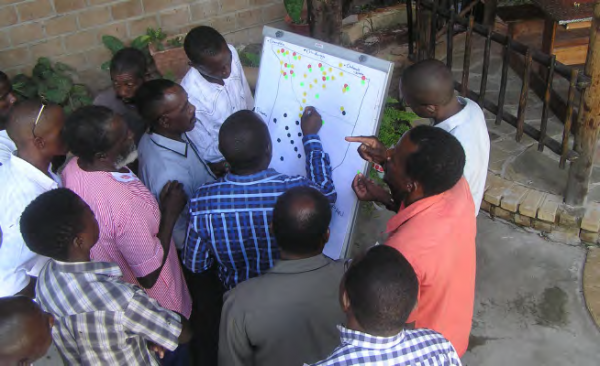 During the workshop, the participants, including members from the traditional local authority, community leaders, agricultural and forestry technicians, and members from local conservation groups, engaged in a mapping activity in order to outline the landscape and to identify key resources and areas of concern. Participants further identified and discussed the various land uses, economic activities, and infrastructure within the conservancy. Additionally, community members were invited to rate the current conditions of the Conservancy using the SEPLS Resilience Indicators. The results of these indicators were used to discuss priorities and strategies within the target landscape. The information collected during this initial stakeholder consultation workshop was used as input for the development of the Landscape Strategy. The major threats with respect to the landscape that were captured during the Community Consultation process include negative impacts of climate change on food security, the lack of ecosystem protection, a reduction in ecosystem services, particularly for livestock farming, loss of agricultural biodiversity, weak institutions for biodiversity and ecosystem protection, limited access to markets, and outward migration from the landscape. At the same time, this process identified the major local opportunities, which emphasized the significant tourism potential due to the landscape’s geographical location bordering the Etosha National Park. The goal of the COMDEKS Namibia Landscape Strategy is to promote the maintenance and rebuilding of the Iipumbu-ya-Tshilongo Socio-Ecological Production Landscape (SEPL), where the use of land and other natural resources are managed for inclusive socio-economic development within the carrying capacity of the landscape, and where the value and importance of local traditions and cultures is recognized. Table N-1 illustrates the five Landscape Resilience Outcomes around which the strategy is built to achieve its overall objective, as well as the Performance Indicators that will be used to measure these outcomes. Enhanced provision of ecosystem services within the target landscapes through conservation activities, sustainable use of natural resources, and the protection of ecosystems and biodiversity. · Number of hectares of degraded ecosystems in the landscape restored, rehabilitated, or brought under sustainable resource management. · Number of communities demonstrating sustainable land and forest management practices. Improved agricultural productivity in the target landscape through the promotion of sound and sustainable agricultural practices, resulting in increased food security and income generation. · Number of hectares where more sustainable land use practices are implemented, by type. · Number of farm groups/communities and farmers (disaggregated by gender) participating in adoption of appropriate technologies and systems, including crop diversification, use of local/indigenous varieties, conservation farming, low-cost renewable technologies for drying, and energy efficiency technologies, etc. · Percentage increase in yields of major crops due to COMDEKS activities. Alternative livelihood options promoted within the landscape to enable access to markets. · Number of alternative income sources created through livelihood diversification (e.g., sustainable salt harvesting, handicrafts production and ecotourism). · Number of participating community members (gender disaggregated) benefitting from project activities. · Percentage increase in household income as a result of supported activities. Strengthened institutional systems as well as multistakeholder participatory decision-making for greater landscape resilience. · Number of community-based institutions created or strengthened that are engaged in integrated landscape management. · Number of policies or plans influenced or created at the national and community levels that reflect decisions negotiated in a participatory manner at the landscape level. · Number and type of networks and support mechanisms created. · Number of community members (gender disaggregated) participating in decision-making processes. Emergence of a new model for landscape management and its promotion as a best practice for other landscapes or communities to emulate. · Number of best practices documented in any of the focus areas of the COMDEKS project portfolio. In order to guide the selection of local projects, the landscape strategy for the Iipumbu-ya-Tshilongo Conservancy suggests the following activities that together would contribute to the specified Resilience Outcomes. Establishing community seed banks for local varieties of mahangu. Documentation of environmentally friendly and traditional agricultural practices. Development of small enterprises to sustainably harvest salt from the three major saltpans that are found in the landscape. 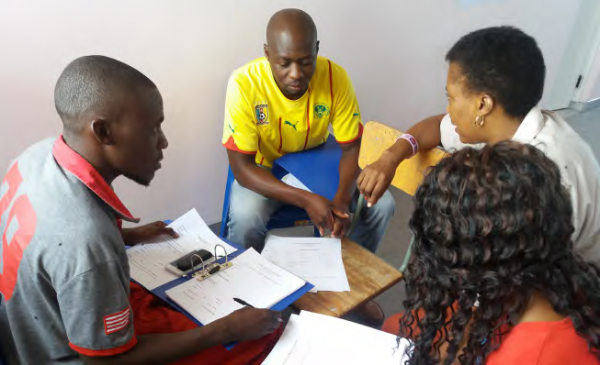 Mobilizing and engaging marginalized and vulnerable groups in project preparation, implementation and monitoring, and creating enabling environments for their social inclusion at the local level. Creating awareness and documenting best practices in the different focus areas of the COMDEKS project. Based on this guidance, six local projects were selected as part of COMDEKS Namibia’s portfolio of landscape interventions in the Iipumbu-ya-Tshilongo Conservancy. Each is led by a different community-based organization, with grants ranging between US$25,000 and US$45,000. The Conservancy goal is to develop ecologically friendly and sustainable tourism in the landscape through (a) the establishment of a conservancy support base for its resource monitors and administration, and (b) the establishment of a community-based campsite. This Conservancy project also intends to support other community-based livelihood alternatives as well. 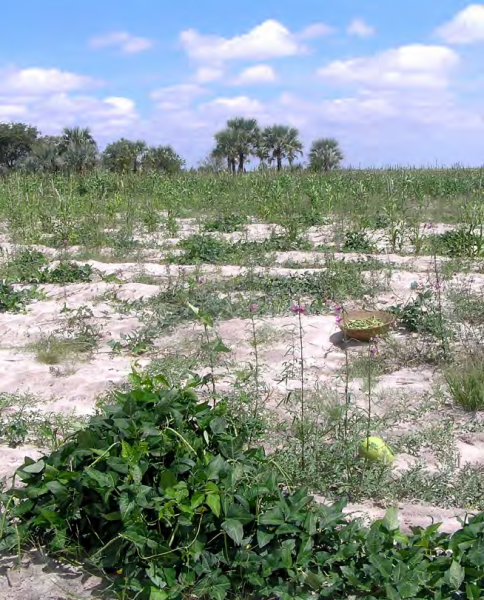 Outcomes 1, 2 The project seeks to improve dryland crop production by promoting sound soil management and sustainable agricultural practices, such as conservation tillage, composting and crop rotation, resulting in increased food security. US$36,454 Outcomes 1, 2, 3 The project targets vulnerable and poor communities, seeking to strengthen their social and skills development with sustainable food production, while promoting reforestation initiatives. Selected households will be trained to set up micro-drip irrigation systems. In addition, the project will establish a Iipumbu-ya-Tshilongo community-based tree planting and distribution center. US$42,000 Outcomes 1, 2, 3 This youth project aims at establishing vegetable gardens with micro-drip irrigation systems to improve food security and create alternative sources for income generation. In addition, feasibility studies on farming guinea fowl and local chickens, as well as aquaculture, will be conducted. Based on findings and lessons learnt, a small poultry house and seasonal aquaculture operations during the rainy season will be established. US$40,000 1,2,4 This project promotes sound and sustainable livestock management practices to increase livestock production. The project will mitigate water scarcity through the excavation of existing dams and ponds, including the creation of a water channel from Etaka. It will also acquire quality bulls for farmers in the area of Uuvudhiya to improve herd quality. US$25,000 1,2,3,4,5 The project will strengthen the institutional and project management capacity (particularly M&E) of the COMDEKS beneficiary groups, enabling them to more easily achieve their intended project outcomes. Bringing ecotourism to the Conservancy: The Conservancy is well on its way to initiating ecotourism services at its newly constructed eco-campsite. After a lengthy review, the government has issued an ecotourism concession license allowing the Conservancy to provide tourist services not only in its own Conservancy territory, but in the adjoining Etosha National Park, which will significantly increase the potential tourism revenue stream. Marketing outreach has already begun, and training in tourism services such as wildlife guiding is scheduled. First visitors are expected in June 2016. Introducing sustainable agricultural practices and expanding agricultural markets: As a step toward addressing land degradation, 100 farmers have received training in Conservation Agriculture (CA), which, among other techniques, uses conservation tillage to prevent erosion and build soil quality. To date, CA is being employed on some 140 ha of cropland, with plans to expand as more farmers are trained (the project goal is 300 farmers trained). In addition, a new agricultural center has been erected where produce from area farms will be marketed. Providing micro-drip irrigation systems and training to poor families: Despite some delays, the committee implementing this project has completed preparations to distribute micro-drip irrigation systems and provide seeds and training to 20 poor families in the community to increase their food security and income potential. Each system provides a drip line from a 240 liter water tank to an array of 200 soil-filled polybags that can then be planted with food or cash crops. To date, the drip systems and seeds have been purchased, water hook-ups provided, and a model system set up at a Forestry Department site to demonstrate the technology and train families who will receive the systems. Establishing a tree nursery to support reforestation: Although still in its initial stages, this project, in collaboration with the Ministry of Agriculture, Water, and Forestry, has already conducted community awareness meetings on the need for reforestation and has established a tree nursery using the same micro-drip irrigation system described above. When fully functional, the nursery will be able to accommodate about 8000 standard poly bags of tree seedlings, which will be used to reforest some 800 ha of land. Mobilizing youth to create alternative income sources and establish a community youth center: To serve youth in the target landscape, the Conservancy group and local traditional authorities granted the local youth group a site which it can develop to raise guinea fowl for sale in local markets. A second activity on the site will be aquaculture practiced in seasonal ponds. To date, the site has been cleared and storage facilities erected in preparation for the poultry operation. The funds generated from poultry and aquaculture will fund the construction and operation of a community youth center providing internet and other social services to Conservancy youth, who often have trouble finding local employment. As mentioned earlier, the different interventions in the landscape are only taking shape now, but already a change has come over the CBO community involved in project implementation. Due to their work together in the community consultation and in putting together and preparing to implement the project portfolio, the different groups involved have begun to act as one body, with a single landscape vision, rather than separate sectoral divisions. The forest committee heading up the reforestation project now works more in collaboration with conservancy members than it had formerly, and the youth group—which heads up a job diversification project—now sees itself as an active contributor to sustainable livelihoods within the Iipumbu-ya-Tshilongo landscape. Likewise, the group heading up the micro-drip irrigation project, which was previously uninvolved in most Conservancy affairs, is now involved in operations spearheaded by the landscape committee. This newfound collaboration has already resulted in an annual meeting in which all projects reported their progress and plans. Additional technical and social support for this cohesiveness will be provided by two concurrent GEF projects now commencing in the area that will provide on-going assistance with the reforestation and irrigation efforts. Even though thorough and comprehensive information was captured during the initial stages of the COMDEKS projects through the Baseline Assessment, additional information developed by the government and by GEF for other SGP projects in the area also proved valuable. Such auxiliary information sources can be equally important and must not be neglected. Ample time for government involvement in project review must be factored into project schedules. Executing the COMDEKS-generated ecotourism strategy for the target landscape took longer than expected because the government had to approve a tourism concession for the Conservancy, due to the fact that the target landscape borders Etosha National Park to the south. Land disputes can create unexpected project obstacles. The project spearheaded by the youth group was brought to an abrupt halt because of a land ownership dispute that only came to the fore after the youth group had already cleared the land and was about to build a center for their different activities. The dispute has since been resolved, but not before delaying the project for months. The COMDEKS projects had the support of an NGO partner from the onset, which was very useful. However, it took some time to align the landscape work with the mandate and funding of the support NGO. COMDEKS has strengthened the collaboration between government, CBOs, civil society organizations, and traditional authorities, and has empowered the communities to be able to negotiate and implement donor-funded projects and to communicate and negotiate with different service providers.